I am late as usual on my President’s Report and it drives Nick crazy. I have a lot to talk about to try to update everyone. First off, the Broadhead was a huge success. Everybody liked the new way we have been setting up the range. A big thanks to the setup crew. We had an outside group do the cook shacks on the range and the food was outstanding. We had everybody telling us to bring them back for as long as they want to come back, they are welcome. They will be at the State Field next weekend. If you haven't been out to Bear Valley, you haven't seen the new 5-Star refreshment stand. Jason Duysing is responsible for the entire project. We had a few people wanting to put in an order for one in their back yard. Talk to Jason if you want one. We hope to duplicate it at the Sniper Stand soon. We are still working on the 24" drain pipe in Bear Valley and it should be done in the next couple of weeks. In doing so, we had to move Target # 15 forward about 7yards. Next time you shoot the back 14 Mountain Range, you will see that Targets # 16, # 17, and # 18 have been completed. Max Burk has laid 99% of the stepping stones. Give him a big, “Thank you” when you see him. Finally, we just finished the sprinkler system to water the entry road to cut down on the dust as you enter the range. Al Wiscovitch did the planning and layout and without his expertise, it wouldn't have been possible. Thank You AL. Also, a huge thanks to Bill Walts for all his tractor and backhoe work on all these projects. Give Bill a big, “Thank you” when you see him. 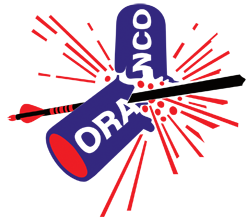 The Firecracker shoot will be on Sunday, June 25th. There will be another work party on Saturday, June 24th. Come out and give us a hand. WE HAVE LOST THE LEASE TO OUR RANGE!! For over 30 years the Kern River Archers have had the opportunity to lease over 100 acres of Bureau of Land Management property located in the Kern River Valley through a cooperative agreement between BLM, The California Department of Fish and Wildlife and the Kern River Archers. Parties involved have terminated our cooperative agreement causing the immediate cancellation of our lease and loss of access to the property for Archery purposes. We are actively searching for a new location for the Kern River Archers to call home. We would like to thank the members of CBH/SAA for their incredible support over the years at our Pow Wow, Bull of the Woods and High Sierra Shoots. We will notify CBH/SAA members once we have obtained new property and can host a tournament. Thank you for your support!! We look forward to seeing you at our new facility. THE KERN RIVER ARCHERS, Board of Directors and general membership. The State Broadhead is almost here, and it’s time to win the $10,000 prize. We are projected to have one of the biggest turnouts ever. Safety / Safety / Safety will be the biggest topic. We don’t want any accidents on the range before, during, or after the shoot. All of the cook shacks out on the range for both of the state shoots coming up will be ran by a High School Booster Club. Now for an educational note to think about, I do a lot of shooting in my back yard and find that when my arrows seem to start flying bad, there is generally a residue coating on the arrow. It usually builds up, from my foam target bail, after about 5 or 6 ends. I find that after I clean my arrows, they seem to fly straighter with more accuracy. Goo Gone seems to work the best to remove the residue. After wiping down the arrows to remove the residue, take a clean cloth and wipe them down again to remove any excess cleaner and check to see if any of the other residue is left. I might be the only crazy person that does this, but it seems to work and my arrows have a pleasant orange scent. So give your arrows a bath, they're dirty. LOL. Till next month, shoot straight and focus on the gold. 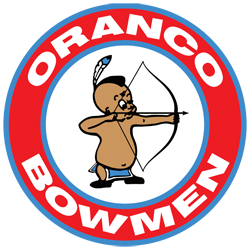 To be a Member of Oranco Bowmen has been a great experience (Member since 2009). We have made a lot of positive changes to the Club. 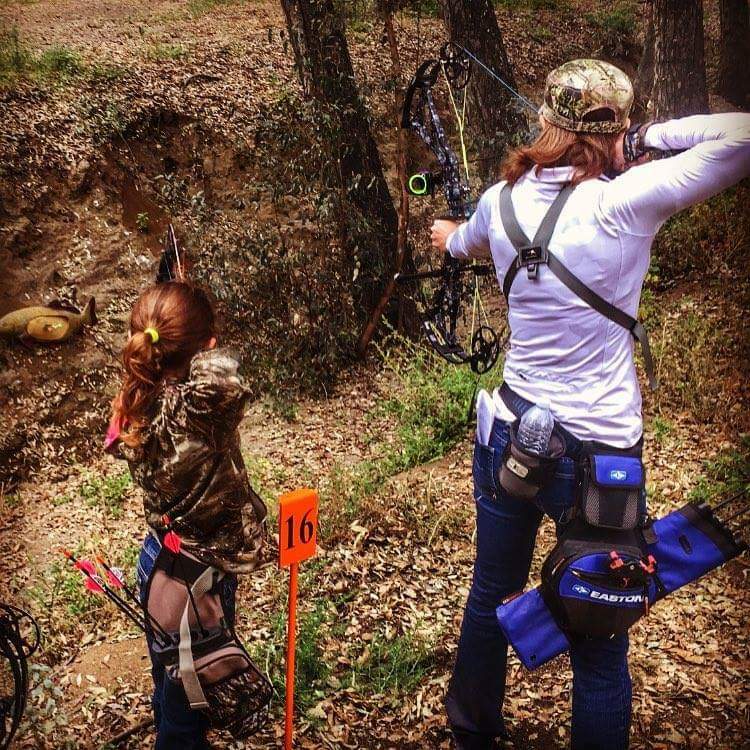 For those of you that do not participate in the work parties, or attend our shoots, or lastly do not attend the Monthly Club Meetings to see the discussions that are ongoing and the amount of work that it takes to keep the Oranco Bowmen Club open and active, we are continually improving our Club. Whether it be by purchasing new 3-D animals for our shoots, which we do almost every year, to continually improving the range. Not sure if any of you have noticed that the old rail road ties are being replaced with gravity blocks for the steps. We have purchased new 24” H.D.P.E. drainage pipe to improve water drainage on the range and the walk ways around Bear Valley. We have also started work on the newly relocated Bear Valley cook shack. We have also placed gravel on the existing roads. These are just some of the items that the Club is doing to continually improve Oranco. We have recently updated the By-Laws, which will be posted later this year on the website. In closing, I would like to thank all the current Board Members for all of the hard work, time, and dedication they put into the Club to keep Oranco Bowmen one of the best ranges in Southern California to come out to shoot Archery and enjoy the atmosphere. Good morning team, I hope this report finds all of you well. April and May have been busy months and June is shaping up to be just as hectic. We have had several 3-D shoots since April and all of them have turned out well. Big thanks to Jason Duysings for his efforts on the Scalps & Skins program. I have only had time to shoot 2 of them, but both were really fun set ups. I would like to reinforce with all Members the need to shoot by the rules. A Membership at Oranco does not give anyone free license to shoot by whatever rules he/she desires. We had a big dust up with a now former Member about shooting 2 arrows at targets during the Scalps & Skins tournaments. This behavior is clearly outside the boundaries of what is acceptable and the individual knew it. What’s more, he decided to start an argument and threaten our Club. His behavior really makes no sense to me, but just be advised that we expect people to obey the rules. This is for everyone’s enjoyment and safety. We are preparing for the State Broadhead Tournament this weekend. This is always a fun shoot so come on out. 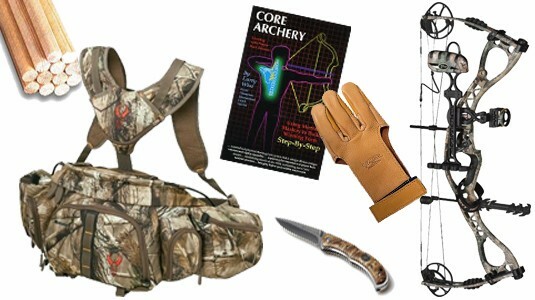 Two days of shooting fairly realistic hunting shots with your broadheads…AND a $10,000 raffle. Should be a good time!! Please also be ready for the upcoming State Field tournament on the weekend of June 10th and 11th. Right now we have about 20 shooters signed up for the tournament will be accepting entries for the next couple of weeks. As always, dry camping will be available. We need serious attention to all Mountain Range Target Assignments. The rains this season have left the weeds very tall. I will need all targets worked either this week or next week in preparation for the State Field. Please make some plans to get down to the range and get these cleaned up as I have to paint a lot of the plugs. Hopefully everyone is making plans to enter the CDFW Big Game hunt draw. 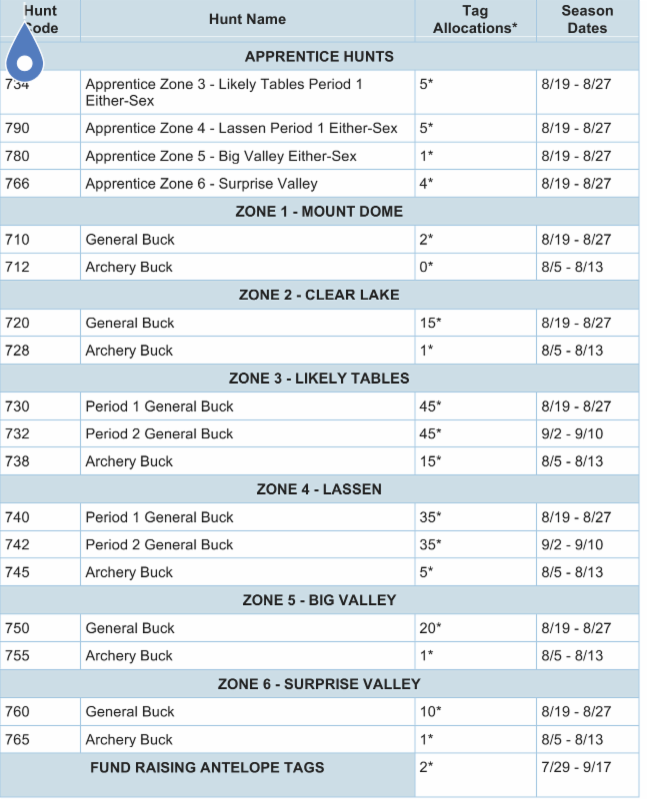 Licenses are now available and your Big Game draws are due by June 2nd. With this year’s rains, I would expect some better activity here in California as it relates to wildlife availability. Get your name in for your species of choice and good luck! I am looking at some upcoming Target Assignment openings for the Mountain Range. If anyone is interested in free dues in exchange for taking over a Target Assignment out back, then please shoot me an e-mail or text with your name and number. I will see what I can do to get you on a target fairly quickly. As always, I appreciate what you folks do for us and if you have any suggestions or needs then please give me a call or send me an e-mail and I will do my best to help you out. The 2017 Scalps and Skins season has come to an end after the 6 shoots. I would like to thank all those who came out to the shoots this season. I have heard a lot of great compliments and suggestions from a lot of you regarding the shoots and I appreciate it. I added a little spin with the last man standing competitions following the shoots. They have seemed to be well liked and add a little fun to the mix. Congratulations to Hunter Antillion and Peter Piche for winning the last man standing competitions. Antillion took home the $80 cash jackpot for the first one, while Piche walked away with $40 on the May 20th shoot. I would really like to see these jackpots get over the $100 mark. I will be adding a few extra shoots as well, targeted towards the Hunters to keep you up on your skills. 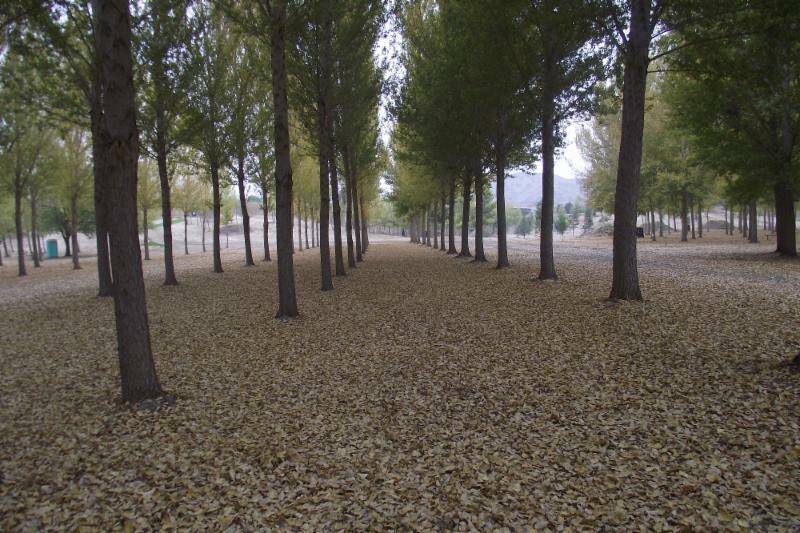 These unmarked shoots will have obstacles to overcome just as if you were out in the field. We will also be doing last man standing money competitions at these shoots as well. Keep a lookout on the website for these future dates. Thank you to all of those who have helped set up and clean up the targets for the shoots. Make sure to check the website for the future upcoming shoots. 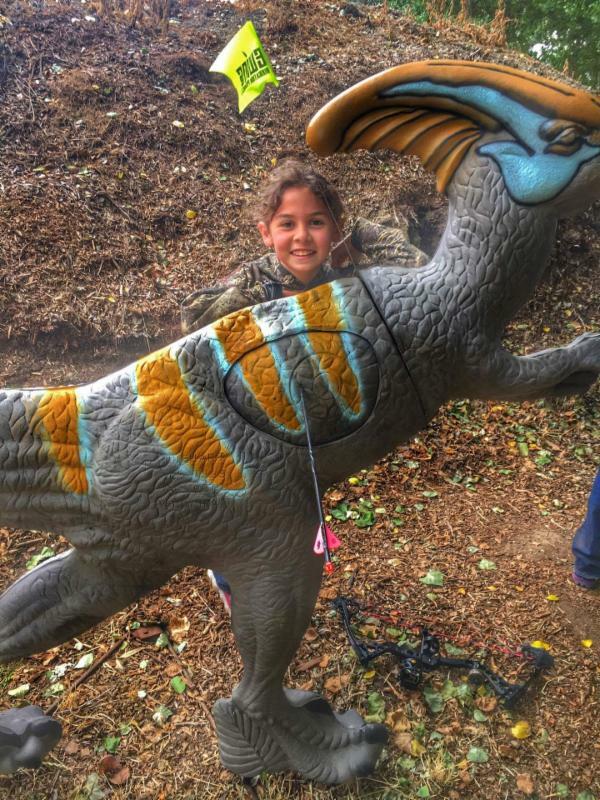 A Velociraptor getting smoked in the 10 ring by Club Member Jackson Mendez - Scalps & Skins shoot. 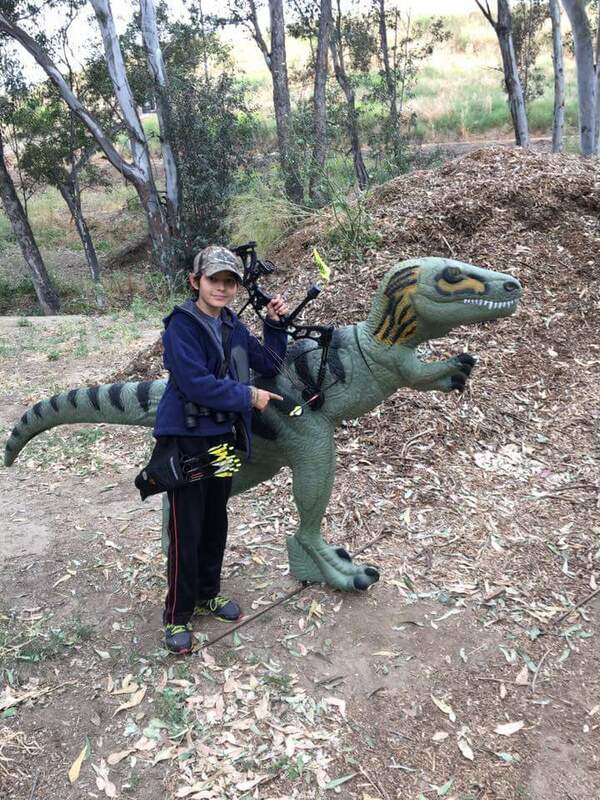 Jesse Nicholson hitting the 10 ring on a Duckbill Dinosaur at a Scalps & Skins shoot. Great shot, Jesse! Jesse and Lorie Nicholson at full draw on a carp at the Scalps & Skins shoot. Joe continued his maintenance of the range this month to include working on the pump switch. Todd Dancer has been spraying the range. On Target # 17, the steps have been completed. The steps on Target # 16 have begun. The well across the street at the Gun Range has been repaired. This included maintenance on the valve boxes. We replaced a tractor tire. Our range fire extinguishers' maintenance is due, so we will be getting them serviced. The range was able to outsource the cook shacks for the State Broadhead to a third party (a group of students from Norco High School). If it works out they will also be helping out with the State Field. 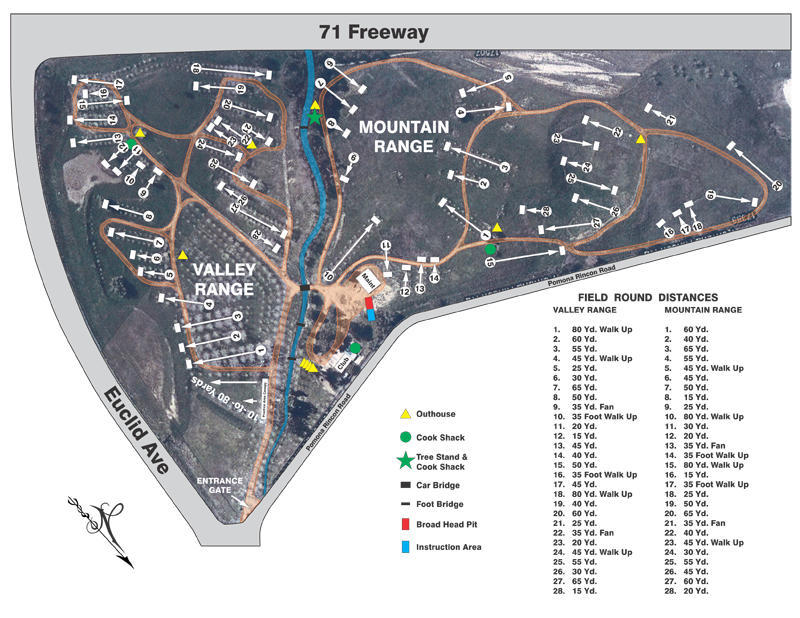 The San Bernardino County Parks Department will be performing their Range Inspection tomorrow. We are hoping to hear about our lease soon. New NFAA Flyers are now available and will be placed in all new Membership packages. A few of the Mountain Range Targets need work. Target # 19, Target # 22, and Target # 23 all need work. Al Wiscovitch will be working on the sprinkler system to reduce the dust exposure on the range. Joe attended the Redding Trail Shoot, where is earned the title of National Champion for his class. Way to go Joe! He said there were a lot of vendors there. A question came up on when we were going to replace our bridge? The answer is we are waiting for our lease to be approved. We will need to do some range maintenance before the State Broadhead to include; target gluing, plug clean up, and general clean up. We have 12 shooters signed up for the State Field so far. A question was raised regarding in the event a serious injury occurred on the range where should we send the injured party? The answer is Call 911 or send them to Chino Valley Medical. There have been some new hunting regulations passed so be sure to read up on them. The Big Game Drawing deadline is on June 2nd, 2017. Pig Hunting should be good this year with all of the rain and grass we have had in California. Archers lost 5 Antelope Tags, 1 Sheep Tag, and some additional Elk Tags. Deer Tags remained the same. There should be some really good litters this year and the animals should healthy. Remember to turn in your Game Cards. Samantha mentioned that on the Work Party Sign Up Sheets the primary Club Member's name must be listed. She has created some new sign up sheets because it is hard to determine the value of each work party for proper credits. Flint Captain reported the amount of shooters for the three most recent shoots. 85-90 at one of them, 55 at another one, and 61 at the last one. There was a discussion on the placement and the lock security for the newly purchased defibrillators. A discussion was also had on the proper use of them. The range will be renting a backhoe to complete several jobs to include work on the water drainage project. Motion was voted on and approved. There was a discussion in regards to the Big Game Shoot T-Shirt's design for the State Broadhead. Kern River Archer is losing the lease on their Club's property due to the recent fire. Firecracker 3-D Shoot Coming up on June 25th. The Club has just recently purchased a large order of 3-D targets for future Club Shoots. There was a discussion regarding the target stand sample we received. Still in progress. A Club Member volunteered to take the information from our Club Award Plaques and convert them to a digital format. Anthony Tobin Is looking forward to the 2017 Tournament Archer of The Year competition. At the Fish and Game Meeting their was a discussion in regards to increased cost of Elk Tags. There were a lot of complaints. The Board Members will resume work on completing the Club's By-Laws after the Fire Cracker Shoot. There was a discussion in regards to closing the FETA Target on Sundays from 8:00 am to 2:00 pm during our "open to the public" sessions. 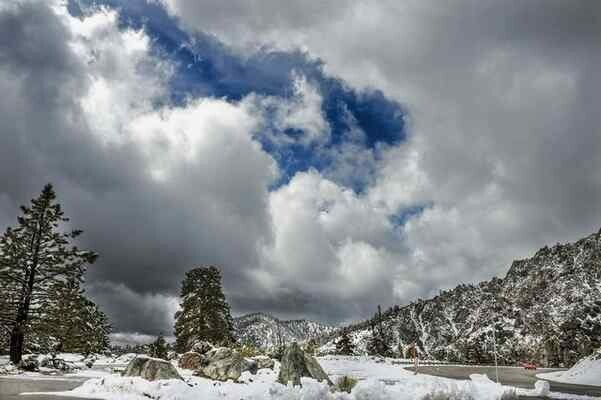 Worried the San Gabriel Mountains, Mojave Trails could be de-listed? The U.S. Department of the Interior is asking for citizens to send in their comments regarding a review of 27 national monuments created since 1996. As ordered by President Donald Trump on April 26, Secretary Ryan Zinke will review 22 land and five water national monuments designated by Presidents Bill Clinton, George W. Bush and Barack Obama, all at least 100,000 acres or more in size. The review could put monuments in jeopardy of losing their protected status, or seeing boundaries changed if the secretary finds they were designated or expanded without adequate public outreach, among other criteria. These national monuments must strike a balance between protection of landmarks with “appropriate use” of federal lands as well as “the effects on surrounding lands and communities” and the “economic development and fiscal condition of affected states, tribes and localities,” according to a Interior Department statement. 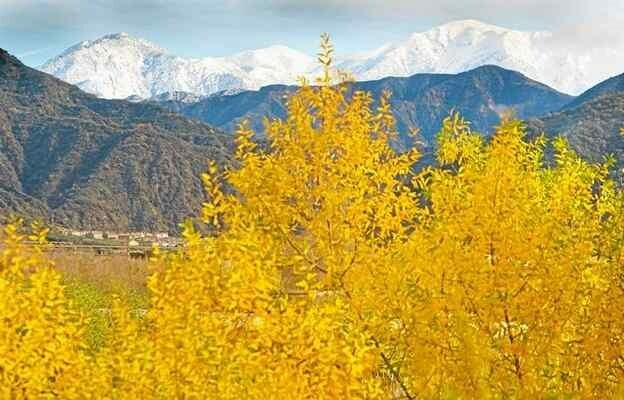 Six monuments in California are under review: Berryessa Snow Mountain, Carrizo Plain, Giant Sequoia, Mojave Trails, Sand to Snow and the San Gabriel Mountains. These appeared on a list of national monuments being reviewed released by the Department of Interior May 5. Comments will be accepted starting Friday by going online at www.regulations.gov and entering “DOI-2017-0002” in the search bar and clicking “Search.” Comments also can be mailed to Monument Review, MS-1530, U.S. Department of the Interior, 1849 C St. NW, Washington, D.C., 20240. Members of the public will have 60 days to submit their comments. If commenting on the Bears Ears National Monument in Utah, comments must be received within 15 days, according to the department. Under review are the Mojave Trails, Sand to Snow and Castle Mountains monuments in Riverside and San Bernardino counties. 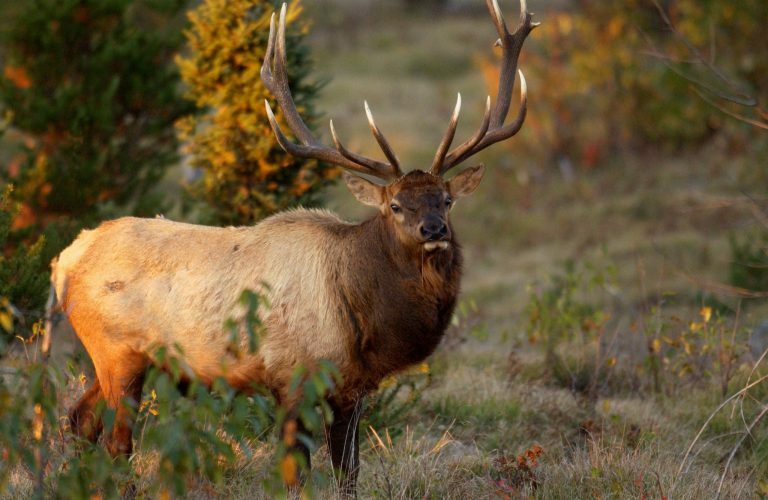 Elk Island National Park is considering an elk hunt to cull a ballooning herd. Posted 3 days ago in Archery, Hunting, Legal Issues, Shooting by Bob McNally. Be the first to comment! I’m sure most everyone knows that a rifle needs maintenance and cleaning done to it regularly to keep it working properly. A bow is no different. Regular maintenance must be done on your bow to keep it in proper working order. It may not seem like there is much to a bow that needs to be done, and there really isn’t. 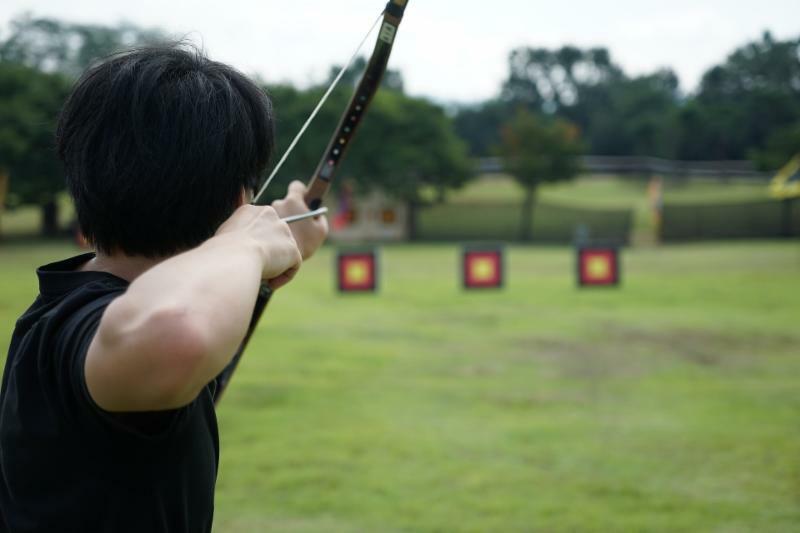 Bow-maintenance should be completed at the beginning and end of the season at the least. Although it should really be done every time you use it.